Alice has sixteen years’ experience working in the areas of cities and urban development, town planning, real estate, infrastructure, environment, climate change and public policy. She leads the World Economic Forum’s cities and urban development work, including the Forum’s Future of Urban Development and Services Initiative, the Global Future Council on Cities and Urbanization, the production of all city and urban development related content and curation of events at World Economic Forum Summits. 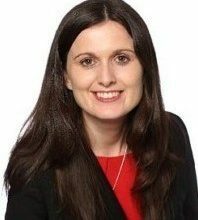 She previously worked for the Department of the Environment, Community and Local Government, Ireland, Dail Eireann (Irish Parliament), Ireland, Jacobs Engineering (formerly SKM Colin Buchanan) and GVA, London, UK. She has a Master’s in Business Administration from University College Dublin Michael Smurfit Graduate Business School, a Postgraduate Diploma in Town and Country Planning from Queens University Belfast and a 1st Class Honours Degree in Environmental Planning from Queen’s University Belfast. She is a Chartered Member of the Royal Town Planning Institute and a Member of the Irish Planning Institute. In 2017 she completed a Masters in Global Leadership through the World Economic Forum, in conjunction with The Wharton School of the University of Pennsylvania, Columbia University, Cornell Tech, INSEAD, London Business School and the China Europe International Business School (CEIBS). She was awarded the Irish Echo Irish 40-Under-40 Award 2017. The award is provided to Irish and Irish Americans who have distinguished themselves in their respective fields of work before reaching the age of 40.